The City Center 5K photos are available. 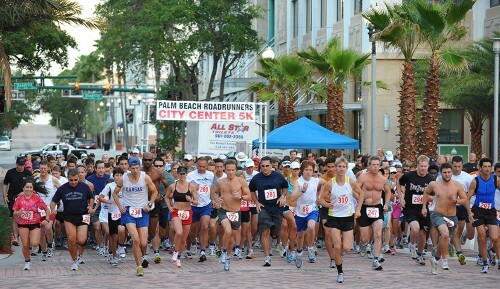 The photos are located on this special site devoted to the Palm Beach Roadrunners City Center 5K Photos. What are running pictures doing on a bike site? Scott Maulsby, Palm Beach Road Runners race wrangler, works with Son Adam and is friends with Son Matt. They were talking one day about the upcoming race and got the bright idea that Matt and I would shoot the event, and that Matt would handle the logistics of creating a place to display the pictures and videos. At least it is for some folks. Some photographers pay race organizers for the right to be the official photographer and make money selling photos to participants. Since we weren’t sure we knew what we were doing, we said we’d do it for free. Where are we going to shoot from? Matt shot the pre-race set up, the mass start, the finish line and the awards ceremony. He also bolted a camera high on a light pole to shoot video of the start and end. I set up at the first turn on Clematis to shoot all of the runners after they had spread out a bit. Then I started walking north on Flagler drive until I met the runners coming back to the finish. In order to get something up quickly, I created the following slide show video and posted it to YouTube. For high quality stills that made up the video above, go to Palm Beach Roadrunners City Center 5K Photos. There will be close to 1,500 photos of pre-race setup, runners along the course, volunteers, the finishers and the awards ceremony. We can practically guarantee that any participant will be in multiple shots. Matt used his Nikon D-700. I used my Nikon D-40 in sports mode. The video camera was a Canon FS100. Good job on the photos. Looks like they had a good turnout. But I’m surprised and a bit disappointed I saw no mention of this “good news” event in today’s “local” newspaper.